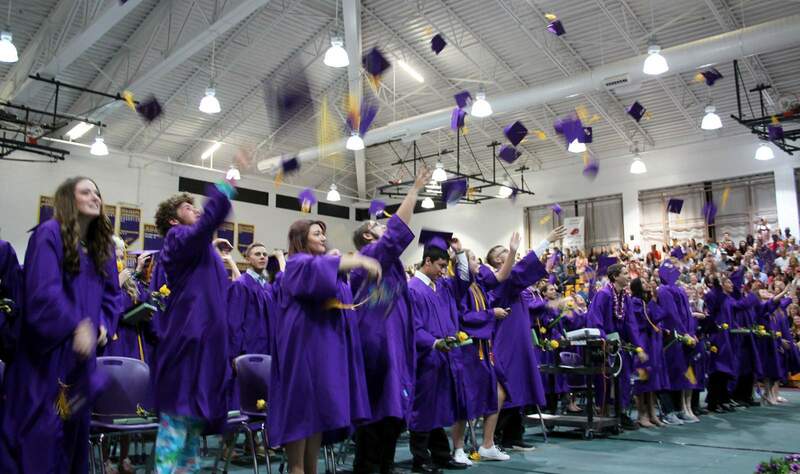 Mortarboards fly through the air Sunday at Bayfield High School at the conclusion of the graduation ceremony. Carl Heide, BriAnne Marr and Mary Grayson share a smile as they prepare to head into graduation ceremonies inside the BHS gym on Sunday. In addition to Colorado championships in football, poms, basketball, boys track and field, and cabinetmaking, this year’s seniors also earned $1.2 million in scholarships and had students in the running to be National Merit Scholars, noted Principal Leon Hanhardt. 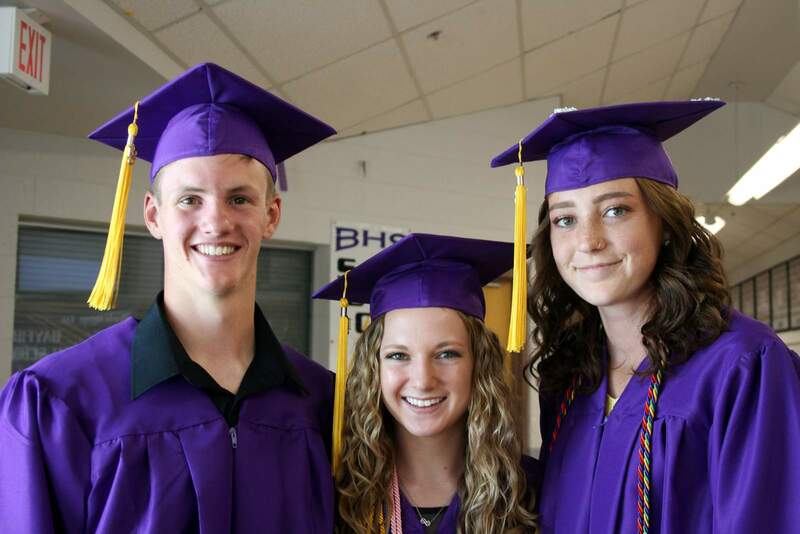 While parents and teachers are important to their students’ success, ultimately, it is up to the seniors themselves to finish their high school careers and obtain that cherished diploma, said Troy Zabel, former Bayfield superintendent. Collin Jackson and Zenn Roberts spoke as the co-valedictorians for the big day. The class chose Dianne Milner, a math teacher at BHS, to present the class address. She started off her speech by singing the quadratic formula, and numerous BHS grads in the audience sang it along with her. Milner had three pieces of advice for the graduates. First, she told them to take risks. If graduates don’t take chances in the future, they won’t fail, but neither will they succeed at much, either. Second, she asked them to unplug and be present. Undistracted time without TV, devices and phones is important for brains and spirits to unplug. Finally, she asked each graduate to practice gratitude. Sometimes it is hard, but concentrating on what we have in life, not what we don’t have, creates a better world, she said. Bayfield High School graduation Eight-four students graduate this year. Eight-four students graduate this year. Jake Sandrey, right, proudly shakes hands after receiving his diploma Sunday. Colt Salazar greets his diploma with a big grin Sunday during Bayfield High School’s graduation ceremony. Jakob Box, center, prepares to exit the Bayfield gym after commencement exercises Sunday. Carl Heide, BriAnne Marr and Mary Grayson share a smile as they prepare to head into graduation ceremony inside the BHS gym on Sunday. Sloan Mazur chomps down on his graduation rose as he carries it offstage on Sunday. Cordell Ashcraft prepares to head out Sunday. Each graduate received a diploma, book and rose during the commencement ceremony. Cole Wood and Principal Leon Hanhardt compare footwear on Sunday. Wood graduated in flip-flops, while Handardt is wearing an orthopedic boot. Members of the Class of 2018 move their golden tassels from their right to their left to symbolize they are now high school graduates.